Though leprosy scared off most people in 19th-century Hawaii, that disease sparked great generosity in the woman who came to be known as Mother Marianne of Molokai. Her courage helped tremendously to improve the lives of its victims in Hawaii, a territory annexed to the United States during her lifetime (1898). On January 23, 1838, a daughter was born to Peter and Barbara Cope of Hessen-Darmstadt, Germany. The girl was named after her mother. Two years later the Cope family emigrated to the United States and settled in Utica, New York. Young Barbara worked in a factory until August 1862, when she went to the Sisters of the Third Order of Saint Francis in Syracuse, New York. After profession in November of the next year, she began teaching at Assumption parish school. Marianne held the post of superior in several places and was twice the novice mistress of her congregation. A natural leader, three different times she was superior of St. Joseph’s Hospital in Syracuse, where she learned much that would be useful during her years in Hawaii. 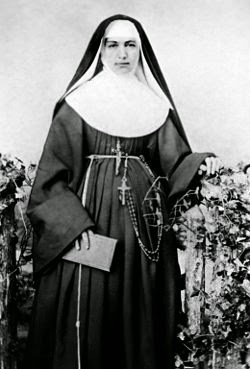 Elected provincial in 1877, Mother Marianne was unanimously re-elected in 1881. Two years later the Hawaiian government was searching for someone to run the Kakaako Receiving Station for people suspected of having leprosy. More than 50 religious communities in the United States and Canada were asked. When the request was put to the Syracuse sisters, 35 of them volunteered immediately. On October 22, 1883, Mother Marianne and six other sisters left for Hawaii where they took charge of the Kakaako Receiving Station outside Honolulu; on the island of Maui they also opened a hospital and a school for girls. In 1888, Mother Marianne and two sisters went to Molokai to open a home for “unprotected women and girls” there. The Hawaiian government was quite hesitant to send women for this difficult assignment; they need not have worried about Mother Marianne! On Molokai she took charge of the home that St. Damien de Veuster [May 10, d. 1889] had established for men and boys. Mother Marianne changed life on Molokai by introducing cleanliness, pride and fun to the colony. Bright scarves and pretty dresses for the women were part of her approach. Awarded the Royal Order of Kapiolani by the Hawaiian government and celebrated in a poem by Robert Louis Stevenson, Mother Marianne continued her work faithfully. Her sisters have attracted vocations among the Hawaiian people and still work on Molokai. Mother Marianne died on August 9, 1918 and was beatified in 2005 and canonized seven years later.